BOSTON, MA – The Boston Bruins are teaming up with Velcro Companies to launch the third annual “Battle of the Books” competition. The organizations invite classrooms in schools across New England to enter their favorite book into a bracket-style competition in which students and educators vote to select the ultimate winner. 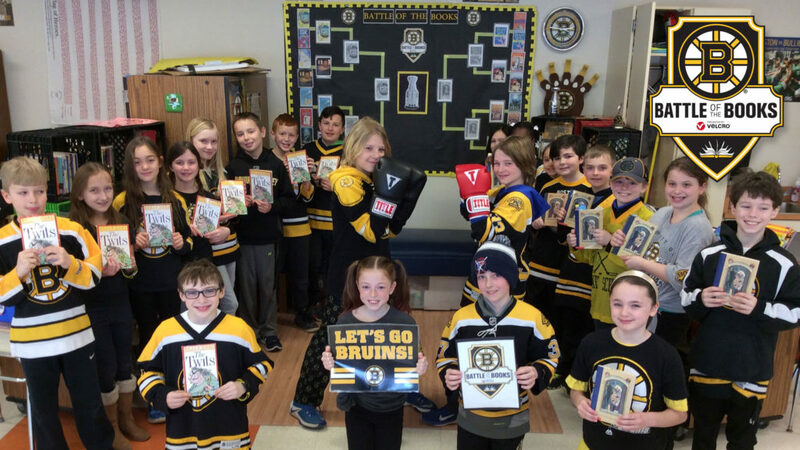 By adding friendly competition with Bruins-themed and VELCRO® Brand prizes, the Boston Bruins and Velcro Companies aim to generate enthusiasm for reading and literacy amongst students of all ages. To kick-off the competition, each classroom will select sixteen books, reading through two at a time and voting on that winner. Each winning book will advance to the next round, culminating in a “Battle of the Books” winner. This year’s competition features prizes for students and classrooms, including a Boston Bruins BFit School Assembly Program, featuring high-energy and festive activities and the Bruins’ mascot, Blades. The BFit School Assembly Program is a 45-minute all-school program focused on promoting a happy, healthy lifestyle by emphasizing perseverance, proper nutrition, and physical activity through movement. The program is run by the BFit team and Boston Bruins Director of Health, Fitness and Wellness, John Whitesides, who will run the kids through a fun and engaging program that uses the sport of hockey and the Bruins as examples of ways to make healthier life choices. Together, the Bruins organization and Velcro Companies will provide weekly prizes for select classrooms based on photo submissions. Among the grand prizes are $500 Amazon gift cards and a supply of VELCRO® Brand products for classroom organization and décor. Velcro Companies is a technology-driven, global organization providing fastening solutions that solve problems in simple, elegant and surprising ways for businesses and consumers around the world. We have a heritage of innovation spanning more than 50 years and own over 400 active patents and numerous trademarks, including the VELCRO® trademark, which is registered throughout the world. We develop and deliver solutions for customers through an integrated production and service system that includes manufacturing locations in the United States, Belgium, Canada, Mexico, Uruguay, Spain and China and sales offices around the world. To buy genuine VELCRO® brand products and to find out more about our company, visit Velcro.com.